Simone Askew is making history as the first black woman to lead the Long Grey Line at the U.S. Military Academy. The 20-year-old international history major from Fairfax, Virginia, assumed duties as first captain of the 4,400-member Corps of Cadets. That’s the highest position in the cadet chain of command at West Point. Cadet Simone Askew — the first African-American woman to be First Captain of West Point’s Corps of Cadets — cheers on members of the Class of 2021 at a checkpoint. Askew is only the fifth woman to lead the Corps of Cadets, according to West Point spokeswoman Theresa Brinkerhoff. After a federal law was passed in 1975 allowing women to be admitted to military academies, the first co-ed class graduated West Point in 1980. 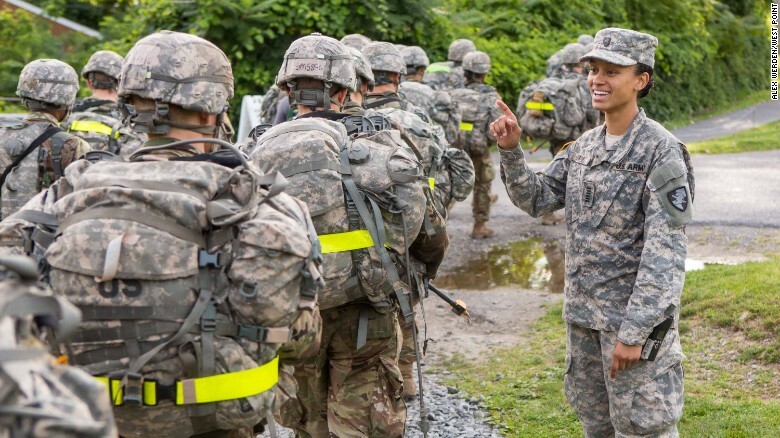 Now, according to statistics on the West Point website, 15% of the Corps of Cadets are women. When asked about the historic nature of her appointment, she said she had been so busy this summer with other training commitments that she hadn’t had much time to fully reflect on it. But, she said, she was “humbled” by the “eye-opening” opportunity. Askew, who will graduate in May 2018 from West Point as a second lieutenant, is interested in military intelligence, but said that could change before she graduates. For now, she wants to focus on her newest assignment. “Our success is defined by the success of those we lead,” she said.